If you don’t love yourself, how in the hell you gonna love somebody else? | More blue fabric? If you don’t love yourself, how in the hell you gonna love somebody else? 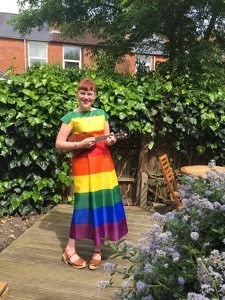 I regularly play ukulele as a part of Moselele and, whilst most of the time that just means sitting in a pub and raucously singing songs from the 80s, it also sometimes means performing actual concerts. This year, we were asked to play a set as part of the celebrations for Birmingham Pride, which is held annually on the late May bank holiday. My immediate thought on hearing this was “I need to make a flag dress”. 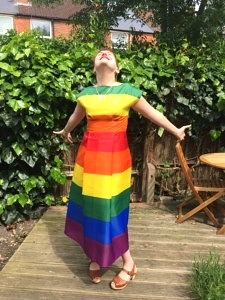 A giant rainbow of a dress. Yes. And red, and orange, and yellow, and green, and purple. 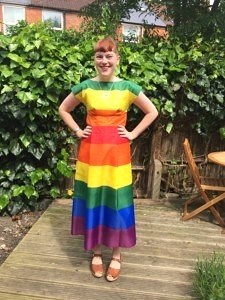 The fabric is Pride flags. That’s right, actual flags. Nasty synthetic polyester flags. I used the By Hand London Anna for the bodice and self-drafted the skirt. By which I mean that I put a simple box pleat in the middle. It was the happiest thing to make. 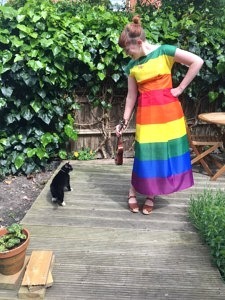 I spent a while being fussy about which way the colours were going to sit on the dress, and it really paid off as I’ve ended up with a dress that has wow factor and makes me smile just to look at it. It wasn’t so much the making as the wearing. This dress was HOT. All that synthetic, coupled with a hot situation (playing gigs is never cool, ironically) meant I thought I was going to melt before I’d even started playing. As soon as we were done I had to get changed, it was just too much. Not out of flags. Or at least, not for myself out of flags. Despite (or maybe because of?) the loudness of the dress, I’d quite like to have another version made out of actual fabric that I could wear day to day. It’ll need me to construct a fabric using lots of plain pieces, but I am tempted. Although maybe not that tempted when I think about the amount of work it’ll need!